A fantastic way to build rapport with a prospect is to send them an article of interest or an article related to their specific industry. If you are really engaging your prospect with skillful questioning then you will have absolutely no problem doing this. This is a great way for your sales prospects to remember you. Remember, cold calling is not about a quick sale, it's a process that happens over time and when you take the time to send articles this technique will help to instantly build credibility. If your prospect mentions that they're going on vacation to Europe then send an article called "Best Sites to See in Europe." If your prospect mentions that their A/C broke down and you will need to call back next week. Try locating a few local contractors in their area and forward it to them. If your prospect mentions they're having a slow year then find articles related to business growth. If your prospect indicates that they're thinking about updating their website then find an article related to what makes a website draw TONS of traffic. It really doesn't matter what the subject is because the point here is that you listened to them and then followed through. I strongly encourage you to send this article in the mail rather than via email and make sure that use a pen to write a few comments (make sure to sign your name). Email can be a bit impersonal, but mail gives the perception of being more genuine. You could even circle and underline a few key points of interest and use a yellow highlighter to further illustrate your genuine interest in helping them. Copyright 2011 Mr. 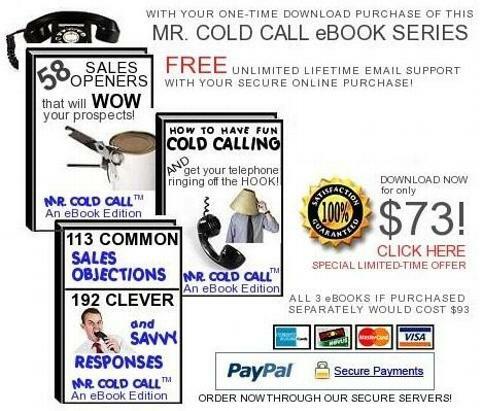 Cold Call, Inc. - All rights reserved.